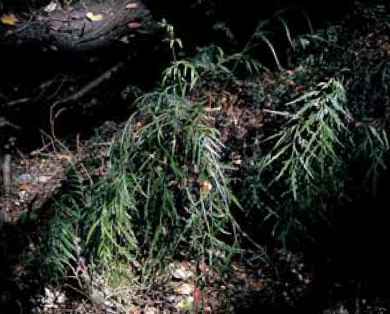 Woodsia elongata (lengthened) from China and above 7500 ft. (2200 m) in the Himalayas is short and narrow. The once-pinnate, 6- to 14-in. (15- to 35-cm) blades taper strongly at the base and have from 25 to 35 pairs of thick, hairy, lobed pinnae that are without stalks. Sori are marginal, covered with both indusia and tissue from the frond margin. While rarely available, this deciduous species is a featured candidate for the foreground among rocks in Zones 5 to 8. Woodsia xgracilis (slender), a hybrid between W. alpina and W. ilvensis, is intermediate between the two and not often in cultivation. 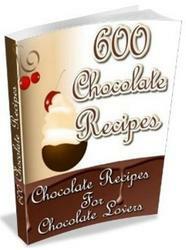 It is from Canada and northern U.S. border states from New England to the upper Midwest. imposters of unknown origin are occasionally in the trade under this name. Woodsia montevidensis (from Montevideo, Uruguay) is a Southern Hemisphere deciduous charmer that deserves attention "north of the border." Sprays of elliptic foot-high (30-cm) bipinnatifid to bipinnate fronds have 10 to 12 pairs of pinnae. The pinnules hug each other, have toothy margins, and are sparsely coated with minute yellowish glands. Magnification is necessary here as, to the naked eye, the glands appear to be scales. Sori are in a three- to four-lobed cup. With populations at high elevations, to 13,000 ft. (3900 m) in South America as well as 9000 ft. (2700 m) in South Africa, this species should transition with delight to alpine gardens in North America and Europe. Plant it in the lee of a boulder in the soil of your choice. Woodsia plummerae (after Plummer) is an upright, deciduous species usually maturing at 6 to 12 in. (15 to 30 cm). The bipinnate fronds are held on dark stipes with both stipes and blades covered with bulbous, stalked glandular hairs. The vivid green pinnae are lobed but without auricles. The species is native to California, the U.S. Southwest, and Mexico where it grows on granite or volcanic rocks. Populations in New Mexico and Arizona are difficult to distinguish from local colonies of W. oregana. However, unlike the latter, they transfer to rocky garden sites with only a minimum of difficulty. Woodsiapseudopolystichoides (like W. polystichoides) is a stalwart Russian. Moss-green, 8- to 12-in. (20- to 30-cm) deciduous fronds are narrowly lanceolate. Ten to fifteen pairs of pinnae are almost bald with just a few scattered silver hairs. Pinnae are stalked, long triangular, and have lobes that separate into an auricle adjacent to the rachis. Sori with cream-colored, cuplike indusia trim the pinnae margins. Although this is fertile, scientists may someday determine that it is a hybrid between W. intermedia and W. polystichoides. Snuggle and treasure it among lightly shaded rocks in Zones 5 to 8. 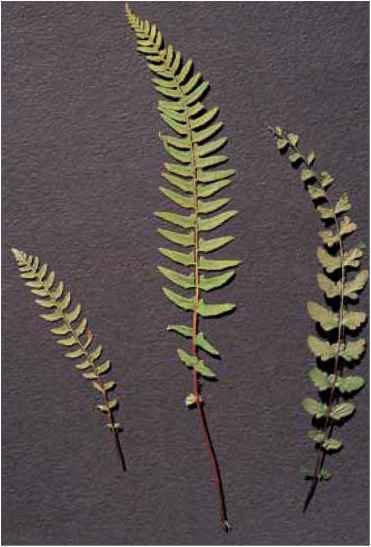 Fronds of (left to right) Woodsia intermedia, W. polystichoides, and W. pseudopolystichoides. Woodsia subcordata (nearly heart-shaped) is, like many of its Woodsia brethren, a wee mite of a deciduous fern that makes an exceptionally adaptable addition to the foreground of the woodland or partially shaded rock garden. The 6-in. (15-cm) lanceolate fronds that taper towards the base are pin-nate-pinnatifid and hairy on the upper surface and both hairy and scaly beneath. With a native range that includes Japan, Korea, China, and eastern Russia, this species can be safely introduced into gardens in Zones 5 to 8.